Zarb Alums Reel in Investor on ABC’s ‘Shark Tank’ | Victor D. López, J.D., Esq. 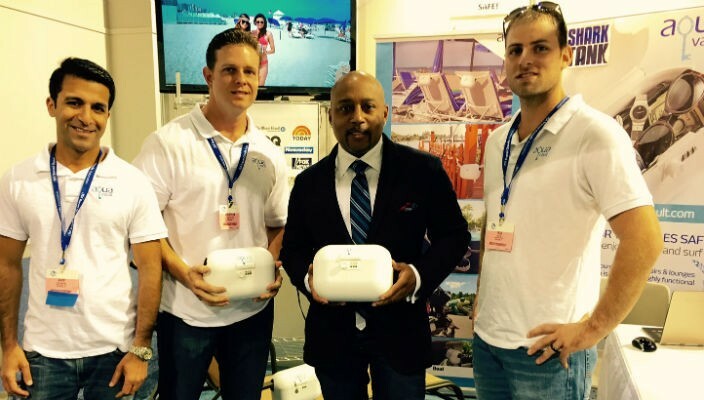 What started as a friendship in 2001 during their freshman year at Hofstra has blossomed into an innovative business venture for Frank G. Zarb School of Business ’05 alums Avin Samtani, Rob Peck, and Jonathan Kinas, who recently pitched their product –AquaVault – on ABC’s “Shark Tank,” and hooked investor Daymond John, who agreed to invest $75,000 for a 25 percent stake in their company. AquaVault is a portable personal safe that attaches to beach furniture, bicycles, strollers and basically any outdoor apparatus to safely stow your valuables while you have fun in the sun. Samtani, Peck and Kinas unlocked the idea after they got burned at a high-end resort in South Beach, where they were staying for a wedding they attended in 2012.